Typically the Ugly stick appears as a traditional sheleighleigh in all respects. Detect Magic will reveal that the object retains magical energy at all times. The Ugly Stick will function only as a +2 sheleighleigh until a detailed Identify spell is cast upon it or the command words are known and enacted by the user. If Comeliness is used in your game, the Ugly Stick is ideally suited to the statistic. Charisma can be replaced with Comeliness if desired, or physical appearance simply tracked and accounted for in character description. The Ugly Stick deals ONLY with physical appearance not social graces. Upon touching, or striking a creature and uttering a command word, the user is able to drain one point of the victims comeliness attribute into the sheleighleigh and transfer it to themselves. Saving Throw Vs Spell applies. Maximum daily transference 6 points. The transfer requires 3 rounds to complete and recharge before it can be used again. The victim feels no discomfort what-so-ever unless they are drained below 6, then loss of teeth and blemishes begin to cause pain. Maximum magical comeliness / charisma transferable to user is 18, transference beyond 18 will lengthen the duration for 5 hours per use. The wielder’s unnatural beauty is in constant decay. The user loses one point of the artificial comeliness every 10 hours. If the sheleighleigh is within 500 yards of the original victim the comeliness / charisma will return to them, if not, the beauty is lost forever. The Ugly Stick can only transfer a comeliness score if the victim has a 4 or more and it cannot drain a character below a score of 3. The beauty transferred is relevant to race / species. Thus is the user is dwarven they will take on features appealing to dwarves. If the user is goblin, they will attain beauty by goblin standards. 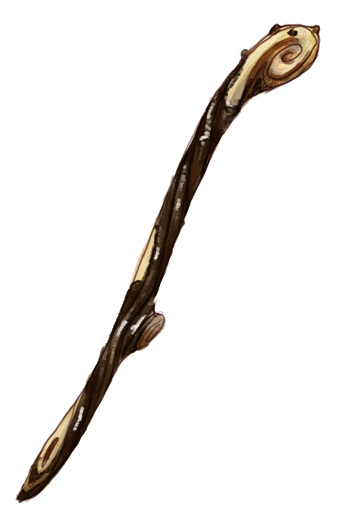 The Ugly Stick is prevalent in elven campfire tales that tell of human and gnomish witches with warnings to not get beat by the Ugly Stick. It is made from Blackthorn wood carefully oiled with butter specifically mixed from a black sheep, a yak, and a shetland pony. It is then stored and cured in the chimney flu of a beautiful or handsome royal for a number of months. The traditional method of oiling and polishing the sheleighleigh wood must be observed. after this, a hollow is made in the head of the sheleighleigh and it is filled with 1/4 oz blessed pure gold from a Lawful Good church, 1/2 oz of pure silver, and 2 oz of lead that has been kept in an ogres pocket for a day. A powerful wizard or witch will then imbue the Ugly Stick with its magical bonuses and a spell of permanence is cast along side a polymorph other spell. This process is occasionally debated among researchers and wizards in casual conversation, but few if any have ever seen an Ugly Stick. Most consider it a thing of legend told to children and princesses to keep them from straying into the wilds.